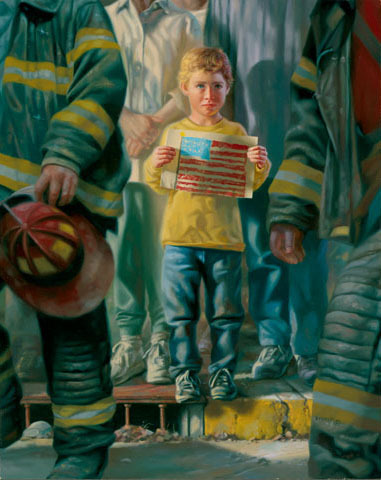 As the artist Bob Byerley followed the tragic events of September 11, 2001 he was moved and inspired by the outpouring of compassion and the patriotic mind-set of the American people. This image is Byerley’s tribute, not only to the valiant heroic acts by the fire, rescue and police departments, but also to the American children who have shown us a rebirth of the true American spirit. The boy who posed for this painting, Graham, loved seeing the original painting but was overheard to say, as he was leaving the studio, "But, I want to take my picture home!"